A guest article on Serbia’s politico-intellectual heritage from Nebojsa Malic. Alter the victory of the Radicals in the December elections, a chorus of condemnations arose from Western governments, press and think-tanks. Serbia was going “fascist,” they said; the Radicals’ strong showing was a “return to nationalism” and a “turning back the tide” of progress achieved under the ever-so-pure DOS. Reality, of course, was nothing of the sort. Certainly, organizations and governments with vested interest in perpetuating certain policies in Serbia might have been expected to react this way. But such proclamations also came from people who fashion themselves Serbia’s “intellectual elite” � the self-proclaimed activists for democracy, human rights, and peace who happen to be just the opposite. Similar groups exist in most post-Communist societies, composed of people who replaced their erstwhile Marxist zealotry with similar fervor in propagating “open society” and other dogmas of the modern managerial state. This phenomenon, like many others, is simply more pronounced in Serbia. Prominent sociologist Slobodan Antonic wrote about a year ago [Serbian original here] about the phenomenon of “Missionary intellectuals,” which he described as “a group that perceives itself as missionaries of the Atlantic world and its values in Serbia.” He offers examples, among which are - unsurprisingly - people such as Sonja Biserko and her entourage (Teofil Pancic, Latinka Perovic, Nebojsa Popov, etc.) known for almost pathological disdain for Serbian ethnicity, tradition, history and culture. Antonic underscores several character traits of the Missionaries. Their dogmatism produces “intolerance towards criticism, and even any disagreement, however reasoned… all those who exhibit even the slightest differenceof opinion are politically demonized, while the debate about ideas is replaced by name-calling denunciations.” Their “cognitive exclusivism” takes after Marxism, so “their epistemology is so epistemologically superior it is beyond criticism… They are immune to criticism because they have defined all other positions as nationalist [and therefore evil] by definition.” And their language is that of intolerance (surprise! ), exemplified by streams of invective aimed at political opponents (i.e. just about everybody who is not “worthy” of their elevated wisdom), e.g. “selfish, fucked-up bastards in the Silent Majority”, “feeble-minded advocates of anti-democracy, nationalism and chauvinism,” etc. The last, but not least, is their call for increased repression, such as banning books, political parties, music and organizations whose authors and ideas they disapprove of. Obviously, here’s a group that believes extremism in the quest for “Atlantic values” (whatever they may be) is no vice, but the highest virtue. Reading between the lines is not necessary here: Antonic clearly believes that the DOS regime was the equivalent of foreign occupation, where the Missionaries ran amok with overt support of the authorities (and in some instances, they were the authorities). It is worth noting that the article originally appeared on the pages of Vreme (Time) weekly, a paper known for its backing of the very globalist “liberals” that Antonic criticized. In fact, this was a public manifestation of the conflict between the zealous liberals (e.g. Biserko, Kandic, et al.) and their more “moderate” brethren, who felt uncomfortable with their violent and hateful rhetoric. While the “moderates” are still the majority of Serbia’s globalists, the West continues to pay attention to the fringe - but oh so very loud - proclamations of the “Mondialist Pasdarans” (as Antonic dubs them, referring to the fanatical Iranian Revolutionary Guards). Antonic’s critique of Missionaries appeared in February 2003, in the midst of a clash between these extremists and the mainstream Serbian “liberals” (counterparts to American and British parties of that persuasion, not the true, classical liberals of the XIX century or today’s libertarians). Just over a month later, Prime Minister Zoran Djindjic was assassinated, and the Missionaries took over the helm of government. But while they seemed triumphant in the debate (which, of course, was nothing of the sort) the repression and naked power grab they indulged in over the next nine months demonstrated to Serbians the true colors of their would-be “saviors.” Those who called most loudly for “de-Nazification” of Serbia turned out - unsurprisingly, if one may note - to be most like the Nazis in their thoughts and deeds. Unfortunately, such is the delusional character of their fanatical dogmatism that they absolutely did not understand the message Serbian voters intended to send them, when they threw out the DOS regime in the December elections. Instead, the crushing defeat of the Missionaries’ nine-month dictatorship was condemned as the “return of fascism.” Today, the missionaries spout identical nonsense as they did a year ago. Entrenched in their contempt of reason and dialogue, they seem to be completely beyond persuasion. While similar groups can be found throughout the former Communist bloc, the “missionaries” in Serbia have a peculiar distinction in their overt hatred of their own ethnic identity. They explain it in terms of shame over the atrocities allegedly committed in the wars of the 1990s, but that does not explain why they choose to believe the foulest atrocity stories even after they’ve been proven false. Antonic’s explanation, linking their dogmatism to Marxism helps clarify things a bit. Having come from that system, most of these “intellectuals” have never abandoned Communism except in name. Latinka Perovic, for example, was a major figure in Serbian party leadership in the 1970s, when she was purged for ostensibly “liberal” tendencies (which bore little resemblance to actual, classical liberalism). Other major figures in the missionary movement are all scholars of social sciences who were educated by the Communists, and retained Marxist methods of thinking and even many Marxist beliefs, albeit under different names nowadays. What’s important to note at this point is to which extent Yugoslav Communism was anti-Serb in nature, ever since the Yugoslav Communist Party emerged in the 1920s under Moscow’s aegis. Soviets hated Yugoslavia - and its Serbian monarchy - for the support and refuge it offered the Tsarist “Whites.” They resurrected the Austrian bogeyman of “Greater Serbian hegemony” in an effort to destroy the country and the Serbian monarchy in particular, in order to re-create a miniature Soviet Union on its ashes. To that purpose, the Communists backed Croat fascist separatists (Ustashe) and Kosovo Albanian irredentists, and even applauded the Nazi invasion of 1941, which resulted in Yugoslavia’s dismemberment (it helped that Hitler and Stalin were still allies, too). The Communists’ virulent Serbophobia was somewhat tempered by Tito, who needed Serb support to fight the Germans, but he nonetheless proceeded to re-create Yugoslavia precisely along the pre-war lines of Sovietization. One important difference was that Stalin and is successors sought to Russify the USSR and crush individual ethnic identities in an effort to stamp out regional resistance and head off Russian opposition, while in Yugoslavia the drive was in the opposite direction, encouraging ethnic nationalism of others at the expense of Serbian identity, which was perceived as the primary peril. 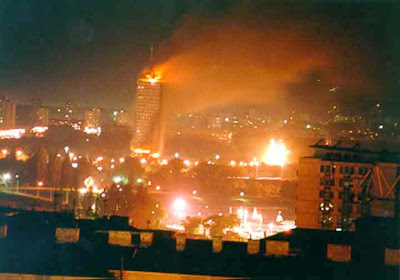 Slobodan Milosevic was vilified by leaders of other ethnic Communist parties precisely because he dared question the sacred precept of Tito’s Yugoslavia that everything was somehow always the Serbs’ fault. The accusation that he was a “nationalist” originated not with Franjo Tudjman and Alija Izetbegovic, actual nationalist leaders of Croats and Bosnian Muslims, but with their Communist predecessors! Therefore, when Serbia’s missionary intellectuals violently loathe the Serbian ethnicity, culture, tradition, history and faith, they are drawing on almost eight decades of Serbophobia nurtured by their ideological forefathers. Back then, they invoked it in the name of Socialist Revolution; today, they use it in the name of “democracy” and “Euro-Atlantic integration,” but the change is purely cosmetic.